The first CPP Board meeting of 2019 took place at Kilmarnock Railway Station Village on Thursday 7 March 2019. Board Members received a warm welcome from the Kilmarnock Station Railway Heritage Trust, and were keen to see the office space and meeting rooms which are available for use by local groups, including the book shop space where the Board meeting took place. The Board were joined by Lynne McNiven, Interim Director of Public Health, who provided a really interesting and informative presentation about Trauma, Resilience and Adverse Childhood Experiences (ACEs). Research shows that children who experience four or more ACEs are far more likely to suffer negative outcomes later in life. This information is important because if we, as community planning partners, can prevent adverse childhood experiences, or better support children and young people who are exposed to them, then we can improve their longer term outcomes: ‘It is easier to build strong children that to repair broken men’ – Frederick Douglass. All community planning partners have a role to play in supporting our looked after children and young people to achieve the best possible outcomes in life and the ‘Promise’ sets out our shared commitment to them. At this meeting, CPP Board Members were privileged to hear directly from one of the young people who had been involved in developing the Promise, about the things that were important to them. She spoke powerfully about the importance of keeping brothers and sisters together and also about the challenges that care experienced young people face when moving into employment. 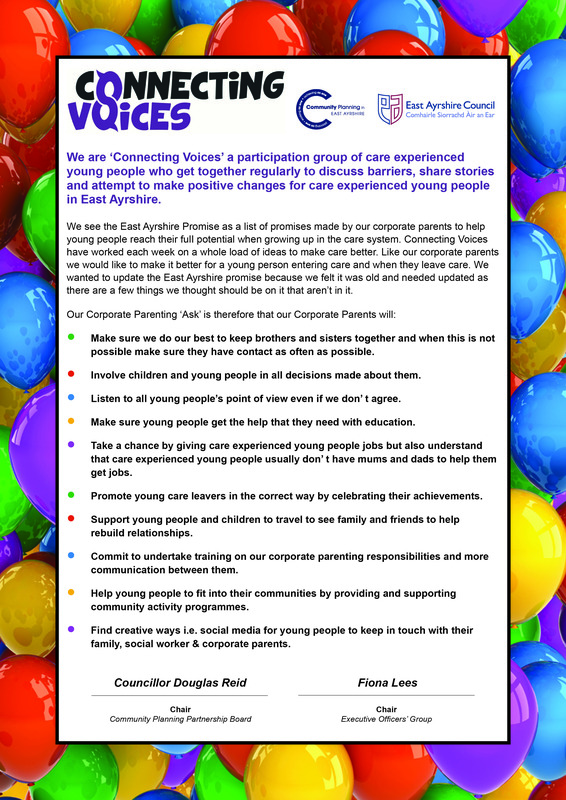 All community planning partners have committed to The Promise and will now work together with the young people themselves to make sure that the pledges set out with the Promise are delivered on a day to day basis for all care experienced children and young people in East Ayrshire. Alison Somerville, Managing Director of Dustacco Engineering attended her first Board meeting as one of the Ayrshire Chamber of Commerce representatives, representing the local business community. Chief Inspector Gillian Docherty, East Ayrshire Area Commander, also joined the Board, replacing Chief Inspector John Cairns as the Police Scotland representative. Board members welcomed the recent confirmation that both the UK and Scottish Government have committed to the Ayrshire Growth Deal, which will bring c£250million funding into the local economy to support delivery of jobs right across the three local authority areas, significant new business and innovation space, enhanced digital and transport infrastructure, business support and £2billion of private sector investment. Specifically for East Ayrshire, the proposals include £23.5m to create the Ayrshire Manufacturing Investment Corridor (AMIC) in Bellfield, Kilmarnock; £16m to develop the Ayrshire Engineering Park to provide expansion and development of Moorfield industrial Park in Kilmarnock; and a £24.5m National Energy Research Demonstrator Project (NERD) in Cumnock. This year’s community planning conference will be a joint session with the Kilmarnock business and retail community, providing partners with an opportunity to engage with the local community in relation to the regeneration of Kilmarnock town centre and the wider community led regeneration agenda across East Ayrshire. It is anticipated that this event will take place April/May 2019. Board Members congratulated CPP Board community representative John Senior on his recent award of ‘Cumnock Citizen of the Year’. This award, given by the Keir McTurk Memorial Committee, recognises John’s commitment to volunteering in his local community. Well done John!